YTD to the S&P 500 is up 1.5% but experienced an intra-month drawdown of 8.59% during February using closing prices. If we include top to bottom intra-day data to calculate the swing it was a 10.3% drawdown at the worst point. February worst month in over two years. We were coming into the month the most overbought since June of 1996, which subsequently was the last time we had an RSI reading over 87 on the monthly data. A similar drawdown happened in July 1996, so the reaction shouldn’t have been surprising. And, if I'm honest, it was welcoming to see volatility again. Below is the S&P 500 Index on a monthly basis. I have placed the 10-month and 20-month moving averages, fib levels, and RSI. You’ll notice we reached the 261.8% fib level in January setting us up for this correction, but the market bounced once it dipped below the 10-month moving average. Setting up March to be our confirmation month for higher, lower, or even sideways. Much of this pay months volatility was because we were at market extremes on a technical basis. We also had a new Federal Reserve Chairman, Jerome Powell, takeover. And throughout history, the Mr. Market has been fond of testing new leader of the Fed Chairs. In recent past, Yellen, Bernanke, and Greenspan were all tested, but the history goes much deeper than that. Basically, I view this as hazing, and just like rush week in college, the joke is on the newbie. For more on this check out LPL’s Research. The short-volatility trade also blew up when the VIX index spike over 50 for the first time since August 24th, 2015. Credit Suisse closed their short-volatility ETF (XIV), and Proshares short-volatility (SVXY) is down an astonishing -89.64%. Many traders and investors had been using these short-volatility ETF’s instead of the SPDR S&P 500 ETF (SPY). 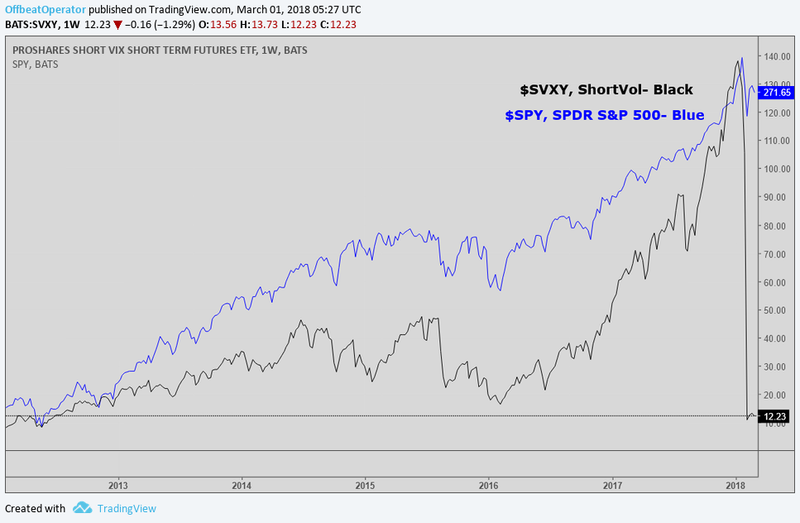 The low volatility environment the past few years created a perversion in the market where short-vol was being piled into like broad-based equity ETFs. I remember an article in the last couple of years recommending investors to switch from SPY to XIV for your equity allocation. The argument as always was more alpha, and it worked since the fall of 2016 until it started to crack one month ago. The chart below shows the gap the short-volatility ETF closed. Sadly, the retail investor never understood the product, or read the prospectus. If they did, they would have known it was a ticking time bomb. With that said, your sector leader was technology once again. With the Technology Select Sector SPDR Fund ETF (XLK) down a measly -0.49%. This is a great sign when leading sectors to continue to lead in weakness. The only concern is potential double top in the sector. We’ll want to see new all-time highs in the sector even if the broader market doesn’t make a new high. And, just for fun, look at agriculture commodities like wheat! The PowerShares DB Agriculture Fund ETF (DBA) was actually positive on the month up 0.89%. In short, March is extremely important. Many market participants panicked during the volatility in February and who can blame them. The mind has been built for “fear of loss” mentality since the beginning of humanity. But as of now, I’m neutral, and the path of least resistance still favors the bulls until we break down further. To back this up, we also got some favorable fundamental data at the end of the month. S&P companies reported revenue growth of 8.2% in Q4 2017 according to Factset. That’s not bearish. Also, earnings estimates for Q1 2018 has risen by 7.8% the past 12 months and 5.8% since December 31st. That’s not bearish either. I like to call this view, cautiously optimistic. And, at worst I think we’ll consolidate sideways, which will contract P/E multiples and bring valuations down anyway. Of course, if we take out the lows, all bets are off this spring. But, who wants to be a pessimist? So, as we begin March and I stare at 4-feet of snow, please remember spring is a time of renewal! *After a tough month for my family in February, I’m glad to be back writing. This month I’ll be producing more technical & fundamental outlooks on single stocks, macro market commentary, and even sharing some personal trials and tribulations my family experienced over February. With the highest RSI reading in over 20 years, what did you expect was going to happen? I understand most new participants might have thought this bull run could continue forever, but any respectable market operator knew they needed to start lightening up in December and January. It wasn’t the question of if the market was going to correct, but when. And, after such a calm bull run since elections, we knew Mr. Market was going to teach any naïve participants a lesson. New participants needed to experience a bit of panic and veterans who became complacent needed a reminder that this market moves in two directions. The S&P 500 Index ripped in January finishing the month up 5.6%, which was the best start to a new year since 1997. We also closed out the month with another milestone, the S&P 500’s Relative Strength Index (RSI) reading was 87.726. This RSI reading was the highest reading in over the last 21 years. In fact, it was June 1996 when we made that last RSI high of 87.252, the same month Michael Jordon won his fourth NBA championship with the Chicago Bulls and the first since his return from retirement. Other than having another potential dynasty basketball team today in the Golden State Warriors, I do see some similarities specifically between 1996-1997 and 2018. And, just like the 90’s Bulls and today’s Warriors, there are some differences. Both markets had bouts of volatility shortly after putting in these extreme overbought conditions on the RSI indicator. In 1996 it took two months, but in 2018 it happened days later. They also shared low volatility before the monthly corrections. Prior to the 1996 correction, they had 18 months of calm markets. Likewise, the current market had 15 months of tranquil markets. The bull run to the RSI reading of 87 in 1996 took 62 months, and the market gained 185% during that time. The run to the RSI reading of 87 in 2018 took 58 months, and the market gained 181% during this time. As you can tell, the numbers are not an exact match, but very similar. Since the before mentioned facts can be coincidental, we next take a theoretical look at where we might line up regarding the 1996 market. I’ll be honest; I take a stretched out thought and think a bit outside the box to gauge where we might be and where we might be going. Before presenting this hypothetical, let's note, there is always debate about when a secular bull or bear market begins and stops. Some use the absolute top or bottom of secular trends, which would mean 2009 was the start of the new secular bull market. But, I prefer to call a new secular bull market when it breaks above the previous secular bear market highs. That’s my preference. We broke out of a secular bear market, inflation-adjusted, in March of 1991 that started in November of 1968. Similarly, we recently broke out of a secular bear market, non-inflation adjusted, in March 2013 that started in August 2000. As I mentioned earlier, I’m stretching here, but we did breakout recently on an inflation-adjusted basis as well. It was 25 months later when this occurred in April 2015 when looking at the inflation-adjusted basis. So, slightly different as I mentioned in my analogy in the second paragraph. The big question is though- where can we go from here? If we look at 1996, it ran another 50 months before topping out, and the market gained another 48% from the volatile July of 1996. That month had a swing of 9.6%, which was a very short-term correction when thinking longer-term. This month we have experienced a 10.3% swing so far, which is close to 1996. I know, I know… We have not yet finished the month, and I easily could be jumping ahead of myself, but in markets, only the future counts. I’m sure there was panic in 1996, just like the millennials experienced for their first time. Unfortunately, I wasn’t able to personally experience this as I was not thinking about the stock market then, but rather more worried about my baseball team standings in Little League. But, we do have sentiment data from AAII back then. Both experienced bullish peaks, but we have yet to experience the lows that 1996 experienced. I acknowledge there are still many differences that I have not covered and should be taken into consideration when looking at the markets. Markets hadn’t run as far ahead of their earnings trend, GDP averaged around 4% in the mid-90’s, and so on… But, from a technical point of view, there is still a chance and potentially another four years and 48% to the upside. This would bring the S&P 500 to about 4700. I understand this sounds ludicrous, but we all know markets can remain irrational for extended periods of time. Plus, we have yet to see the fundamental impact of tax cuts to earnings and estimates are rapidly rising while the markets have fallen. Time will tell how this plays out, but until then I must continue to believe the market direction isn’t at a massive turning point just yet without a major catalyst. Which is why I’m telling you, there is a chance. If you’re like me, you love podcasts with intelligent, thought-provoking conversations with some of the world’s greatest investors. They not only help me to see how other great minds think but also allow me to pick pieces from each person's methods that can be beneficial to my thought process. Not to mention, it gets the creative adrenaline going. One thing you should keep in mind though is everyone’s thought process is different. We can have similar mental models, but not everything that works for one great thinker will necessarily work for another. Also, like investments, make sure you cut your losses fast and let your winners run when listening to podcasts. Time is too precious of a resource to waste on content that isn’t providing some kind of benefit. Without further ado, here are my top ten investment podcast episodes of 2017. · If you don’t know who Tom Russo is, you’re going to want to listen to this episode. Tom specializes in buying globally-known consumer brands and holds them for a very long time. His investment strategy is crafted from early lessons of Warren Buffett, and he is a regular out in Omaha for Berkshire’s annual shareholder conference since his portfolio typically maintains a 10% holding of BRK.A shares. · I’ll admit that I had no clue who Michael Mauboussin was until late 2016, but since then I have gone back through every podcast & recorded speech he has ever done. This year I’m working on reading all of his books and papers. In this episode Michael discusses what a base rate is, the Inside vs. Outside view, and how to calculate the shrinkage factor, which is how quickly in which regression to the mean happens, plus so much more. · Pat Dorsey was a longtime director of equity research at Morningstar and instrumental in the development of the economic moat rating system they still use today. In this episode, he obviously tackles moats, but also the importance of how companies allocate capital. Pat Dorsey is a must read and listen if you truly wish to understand the construction of moats. · A three-time guest on MiB, Scott Galloway is a Professor of Marketing at the NYU Stern Business School and founder of L2. This podcast covers his new book The Four: The Hidden DNA of Amazon, Apple, Facebook, and Google. Scott is a thought leader in brand strategy and digital marketing, and he always has unique views to share in his interviews and blog posts. · You’ve probably seen Roger McNamme on CNBC, but this podcast blew me away. It’s a long episode, but I promise you won’t be disappointed. Roger goes through his career from start to finish, and the journey he takes you on is fascinating and unreplicable, so don’t even try it. I don’t want to spoil this one­­—JUST LISTEN TO IT! · On the inaugural episode, the one and only Godfather of Technical Analysis, Ralph Acampora, is J.C. Parets first guest. It’s not often you get to hear Ralph talk about the markets for extended periods of time since segments on CNBC or Bloomberg are at best a few minutes long. Luckily for me, I have been able to meet Ralph at the Minnesota Chapter Events for the Chartered Market Technicians Association, but for the rest of you, this is a way to see how he looks at the markets and learn some history on technical analysis too. · Another long podcast, but it’s more than worth it! The Knowledge Project comes from the creator of the Farnam Street blog, Shane Parrish. Shane puts out phenomenal content that helps individuals expand their knowledge base, make better decisions, and to improve the overall quality of one's life. His guest is Naval Ravikant the founder of AngelList, a Silicon Valley veteran, angel investor, and one of the best go-to sources on Twitter for cryptocurrency knowledge. Listening to these two great thinkers in a conversation of this length was priceless. I thought it was very interesting the Naval only reads 10% of the books he purchases, but that speaks to the art of cutting your losses quickly. I won’t reveal anything else, but this is a must listen in my opinion. You’ll also get a lot of great book ideas, principles to apply to your life, and more. · Claude Erb has an interesting background, having worked in equity, fixed income, and commodity markets. Also, he was the one employee who left to help form Doubleline that made his way back to TCW within days. If you haven’t read his co-authored paper “The Golden Dilemma” you should. In this episode, he discusses gold and whether it has ever been an effective hedge against inflation, and even a little take on Bitcoin. · I first discovered who Nick Szabo was when cryptocurrency peaked my interest as an investment vehicle. I wanted to figure out how it came about and who the early influencers were which brought me to his blog Unenumerated. As a bonus Naval Raviikant is essentially a co-host, which makes for a great conversation the dives at least into the shallow end of the pool of crypto. This podcast is the longest podcast on my list by far, but you can see a theme starting—the longer the podcast, the better it seems to be. · You might be wondering where you heard the name Guy Spier before if your not that into value investing. Well, Guy Spier and Mohnish Pabrai spent $650,100 to have lunch with Warren Buffet back in 2008. Guy runs his Aquamarine Fund, which is modeled more on Buffett’s initial partnership and Benjamin Graham’s principles, rather than the way Berkshire Hathaway allocates capital. In this podcast, he discusses daily habits, what he’s reading, value investing, and even Bitcoin. I’ve been away for a while spending time with family over an extended holiday season. Although I’ve put some items on the back burner during this time, I wouldn’t take it back. Being able to spend extra time with loved ones has been the best gift I received over the holiday season. Too often we’re consumed with what is happening at the office to do this, so when I had the opportunity, I grabbed hold of it like there was no tomorrow. When I first started this blog in December, the main component was to keep myself honest with myself. Thus, I will be posting my personal New Year Resolutions. Sure, resolutions are cliché, but it’s not a bad time to set new personal goals. I understand you can do this any time of year and you should! But, there is something about starting out the year with fresh goals and ambitions. It’s like having a blank slate, or a system reset back to default with the chance to build all over again. Let’s get started! 1. Write, Write, Write- My goal for this blog was to become a better writer and post at least twice per week. I unequivocally failed at this during the first six weeks. Instead, I spent time with family, which I don’t regret one bit. But, I still should have found time to post something, anything, twice a week. Most would agree that writing helps your thought process. Because often what sounds great in your mind, won’t make sense when those thoughts are put on paper. This process will help your investment performance, strategic visions, and your mental models. My goal for 2018 is at least 105 blog posts during the year with one caveat. That being, if I take a position that does not allow me to write about investments, economics, etc. 3. Chartered Market Technician Level 3 Test- In April, I will be testing for the third level of the CMT designation. Over the past year, I have completed two levels and look forward to obtaining my designation this spring. After I pass the third level, I will need to gather sponsors that are familiar with my technical analysis work. Obtaining these sponsors should be doable given the number of charts I put out on social networks. After this goal is complete, I will be revisiting my continuing education goals to decide if I will pursue an MBA or CFA next. 4. Eat Healthy & Exercise Regularly- Over the years my wife and I poured our hearts into our careers. We put off starting a family, but we also put off our health. Healthy eating is a continued goal which has been progressing yearly. Each year I look to find a few new healthy recipes for meals and snacks that taste great too. We also need to up our exercise game with a goal of exercising five days a week by the end of the year. Now, I’ll never be a health nut. And, I’ll always enjoy some craft beer, single-malt tasting, and baked goods. But, I can limit those intakes by tracking them. I’ll update our progress and make necessary changes come July to keep us on track. 5. My last goal is to continue to refine my trading system. Each year I aim to systematize my investment process more and more. When I first started out a decade ago, l threw darts as everyone does. Even in my first year of professional money management, the process was always changing to adapt to the trendy style in the market at that time. My decision to block out the noise, the fear mongers, and make a rules-based decision process was the best thing I ever did. Eliminating most of the emotion allows you to execute the plan and stick to it during tough times. There will always be a discretionary part of my investment process because it is hard to quantify all qualitative factors. But, with strict screening rules for technical setups and fundamental factors, we can limit the discretionary part of the process to a minimum. My goal for this year is to define specific parameters to determine strategic and tactical asset allocations. I’ve always attempted to stay diversified and benchmarked myself off others asset allocation strategies, but I feel this is an area I can improve on. Out of all of my goals, this is the one I look forward to updating later this year. In July I will revisit these goals/resolutions and update the statuses of each one. Again, posting this is to help keep me honest, and hold myself accountable. I hope you look for a similar process to accomplish your goals or even steal this one. Feel free to comment and let me know other goals I should add to my list or how I can improve upon the given goals. As always, I love constructive criticism and welcome the feedback. Verizon and the NFL announced their new deal for 1.5 billion dollars over five years yesterday. The new deal no longer gives Verizon exclusive mobile rights. However, it will allow them to use their Oath Inc. outlets, especially Yahoo Sports, to reach more consumers. Yahoo Sports will now stream local games, along with Thursday, Sunday, and Monday night games. And if you’re like me, the only thing that has kept you from cutting the cord is sports. My family can get most of our media from online services, which is very cost effective, but a few sporting events have eluded us from cutting the cord entirely- in particular the NFL and my weird obsession with Formula One racing. The NHL, NBA, and MLB all offer packages for every game during the season as well as playoff packages. So why can’t the NFL? Well, the current contracts with the major cable networks won’t allow it yet. I had high hopes this Verizon deal would bridge that gap, but as usual, the consumer is the loser. I found it interesting that every article and press release focused only on mobile. Have you ever tried to watch a game on your phone? It is usually my last resort, not my first choice. If you have bought a Smart TV recently, then chances are it came with the Yahoo Sports app. If you haven’t, the Yahoo Sports app is on other streaming devices, like Apple TV, Amazon Fire TV, and Googles Chromecast. Maybe this is what Verizon should have targeted in their contract negotiations? Getting game coverage on the TV app would have been a huge win for consumers and would have driven cord-cutters to Verizon with the ability to stream games over the big screen. Verizon also dropped the ball by not getting rights to NFL Redzone. Yahoo Sports main feature is the Fantasy Sports platform, and every fantasy football fan loves Redzone. Redzone keeps fantasy football fans up to date on every score around the league all day long on Sundays. If Verizon could have executed and got both of these rights, it would have been a game changer for them. Instead, it is only more of the same. From an investment standpoint, it is better to take a wait-and-see approach. Much like the wait-and-see approach consumers have had to take when trying to cord-cut from big cable companies without losing their Football Sundays. Coming from the Midwest, an unknown school, and only blue-collar connections to start my career, I was destined to be a misfit in the investment industry. From my experience, I have found it is sometimes difficult for those on the East or West Coast to get past the stereotypes that come from my region. “Didn’t attend an Ivy League School?” “Even if he is intelligent, can he handle city living?” “Does he speak like those folks in the Fargo movie and TV shows?” I could go on, but you get the drift. So, I decided to write and put myself out there. Could it be a total disaster? Sure! At least I’ll know that I tried though. Some of you may already know me personally, or from social media. The most likely case is that you have never heard of me- that’s ok though! First of all, I figured it is only prudent of me to tell you why I am writing. Everyone has their reasons for writing and for not writing. Not everyone who decides to write can stick to the process as it is rigorous and grueling at times. Others tend to lose interest in what they are writing. Some people enjoy writing but never find that captive audience. My first reason for writing is quite simple: TO BECOME A BETTER WRITER. If you couldn’t already tell, I am not what you might call a naturally gifted writer. But tried and true-- practice makes perfect. You can read all the books on writing that give you tips, tricks, and processes, but without practice those concepts learned are useless. My goal is to avoid some, if not all, of these pitfalls. Fingers crossed! One thing that has always eluded me though is my own voice. This is the second reason why I am writing. Even when I wrote or presented to clients, it was on the firm’s behalf and not always of my own opinions or thoughts. And, as much as I lobbied for my ideas, message, and vision in the background, it didn’t always make it to the audience. If it did, it typically was conservatively edited. I’d like to be clear- this doesn’t mean myself and the firm were not on the same page. We 100% agreed on our mission to provide clients unbiased responsible and trustworthy advice that always was in their best interest. That mission has been and will always be priority number one to me. With that said, I wanted to beat to my own drum, share my ideas, and illustrate the trends I see in the markets and our economy. The third and final reason I will share was already touched on in the introduction. There is a common problem many individuals have in the investment industry. If you didn’t go to an Ivy League School or don’t have the right connections you have little chance of getting so much as a phone interview with a reputable firm, let alone a job. That is why I make the metaphorical assumption that I am just another “Charlie-in-the-box” from the Island of Misfit Toys. I know I won’t change this mindset broadly, but I feel the street is missing out on some hirable gems that chose the road less traveled. So during this journey, I hope to open the minds of others within my industry to look at individuals with talent from unexpected backgrounds or regions. If you made it this far, thank you, and I hope you will continue reading my blog posts going forward. I look forward to bringing you market insights and even some hot takes you can ridicule and use against me in the future.